Massacre is located in a strip mall near Montgomery and Douglas. There is a front and back to the haunt, but the front door is in back of the strip mall, and if you want to park there, you would have to enter off of Douglas Road. There were several actors scaring people, one man in particular had a very sickly bicycle horn that would scare people. 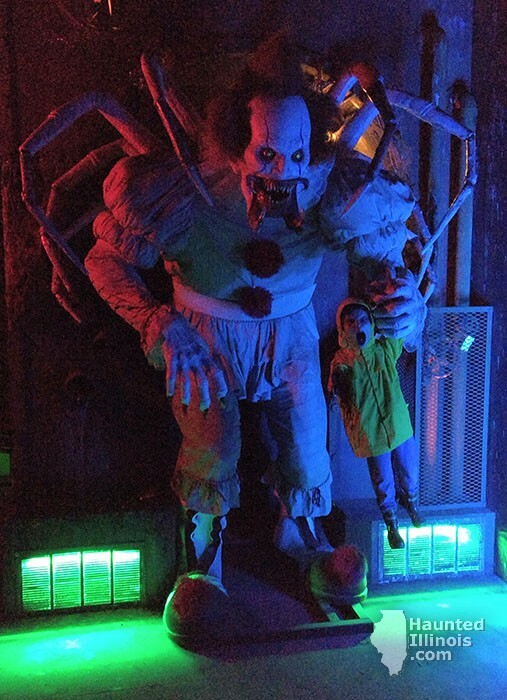 There was also a place to take a picture with a giant Pennywise that was in full spider mode, which I found pretty cool. FREE, and I would like to state again that there is parking both in the front and back of the haunt. What is considered the back entrance is actually the front door in the strip mall. The back parking lot is where the front of the haunt is located. I recommend parking in the front, then walk through a grassy area to get to the front door, that way when the haunt is over, you are right by your car. 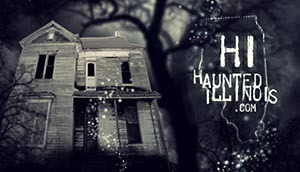 Since people move through haunted attractions at different rates, your time will vary. Note: The time shown here represents the actual time spent moving forward through the attraction. Time spent waiting in queue lines, staging areas, intro scenes, rules rooms and when traffic jams cause patrons to come to a halt, has been subtracted. Very high. I had two women holding on to me throughout the house. No problems, went through smoothly. This house starts out with the laser room, which is a room where they have a laser going across the room, and so you can't see anything below your waist, very good to have a little creature pop out and scare you. This led to a pitch black maze area, where you have no idea where to go. I ended up hitting a couple of walls. This led in to something resembling a castle, with a lot of great twists and turns, with actors popping out of the walls. Next, there was a factory area, that, with some fog in the area, had a really good spooky, hazy effect, and the actors were there to make sure the scare factor stayed up. Clown leads you down a corridor to an Egyptian tomb area, with some cool looking sarcophagi, and the walls were ornate with hieroglyphics. Doctor's office, with a very creepy doctor looking to perform an autopsy on you before you were even dead! That led to several creepy hallways, including one with banging doors at the beginning, so you had no idea where the actors would pop out. We then were led out in to a cemetery area, which led back in to another church setting, complete with many ghosts and goblins looking to pop out and scare you throughout the area. Next, we went through the house area, starting on the outside with some creatures with pumpkins for heads. I especially enjoyed the little girls room, which led in to the doll room, as I find dolls especially creepy. After this, we went in to a room that looked like it had many bride corpses, which I found especially disturbing as they were hanging from the ceilings. Very creepy. This led, from a dark maze in to another maze, this time with both strobes, and the walls made of slatted wood, making it very hard to see through both the shadows and the strobe effect. This led in to another maze, that had the walls get closer and closer as you go through it. You had to walk sideways the walls got so close. After that, they had a jungle area, with several witch doctors ready to put a hex on you for invading their area. They even had a little voodoo section to make sure you didn't stay to be added to their collection. After this was my favorite part, the 3D clown area. They give you a pair of 3D glasses, and have the walls painted with fluorescent paint giving it the look that the images were popping out of the walls. The creepy clowns throughout this part didn't help making things easy to walk through. After getting through that area, you come upon a factory area, which leads you in to a jail scene, with several nefarious looking people ready to break free and do bad things to you. This leads back in to another factory area, with several giant drums to both hide behind, and make loud noises to scare you. Overall, I thought this house was pretty good. They had many places, especially in the walls of many of the areas where the actors could jump out and scare you. And, even in their dark mazes, besides having many things hanging from the ceilings to creep you out, they had some good actors ready to jump out, as well as some light up animatronics that timed out perfectly to scare people. Definitely a fun house to visit.